This is the first printed map to feature Iceland alone. It was in a book by Benedetto Bordone with a very long title, a common practice at the time. Later the title was shortened to Isolario, or Island Description. As the name indicates, it was a book about islands, containing 110 woodcuts, mainly of islands around the world. Iceland here is not much better than on the regional maps of that time. There is only one name on it, the country name Islanda. 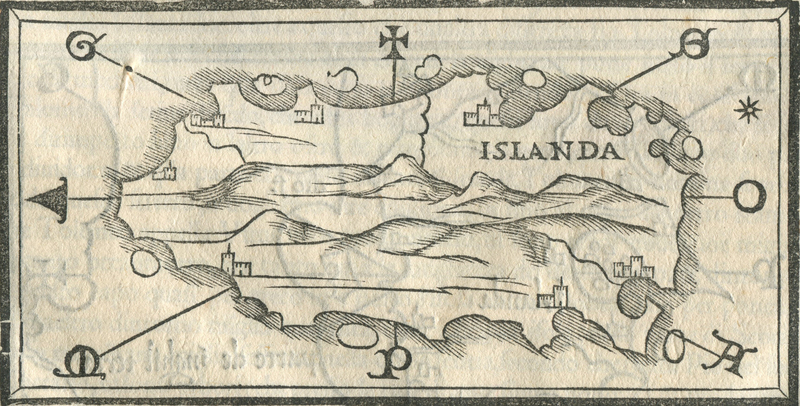 Depicted are seven buildings around the country, presumably cities, and Bordone says there are many settlements in Iceland. For those less acquainted with the demography of Iceland, the biggest dwelling in Iceland at the time, the Bishopric of Skálholt, had less than 200 inhabitants. Currently, the population is about 330 thousand people, with about 1/3 of that number in the only “city”, Reykjavik. Bordone’s Islanda is longer from east to west and in that way an improvement on way Iceland had previously been depicted, on the so called Ptolemaic maps of the Nordics. There are eight small islands around the country. The vertical line in the middle of the country presumably represents a smoking volcano. It is made with woodcut, as all maps at this early date.